Sirmans is entering his fourth season as the running backs coach of the Packers. From 2016-18, Green Bay led the NFL with an average of 4.66 yards per carry, including an average of 5.01 yards per carry in 2018 (No. 2 in the NFL) that was the second-best single-season mark in team history. He joined the Packers after spending the previous four seasons (2012-15) as the running backs coach for the St. Louis Rams. 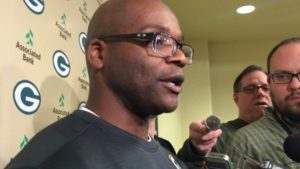 Simmons is entering his ninth season with the Packers having worked in various roles. In 2018, he coached the secondary for Green Bay, helping a defense that improved from No. 23 in pass defense in 2017 to No. 12 in 2018. From 2015-17, Simmons served as the assistant special teams coach. Downard begins his second season in Green Bay after serving as the defensive quality control coach last year. He came to Green Bay after working at Bowling Green for two seasons, serving as the safeties coach in 2017 and the director of football operations in 2016.